Losing a pet is never easy, no matter how much we think we’re prepared. Our faithful companions give us so much unconditional love and joy, and it’s comforting to know that there are many ways we can support them during the last phase of their lives. My partner, Daashia, and I recently lost our beloved nine-year-old Mastiff/American Bulldog mix, Phoenix, two months after he was diagnosed with oral cancer. As painful as it was to let go, I can now reflect on how very beautiful the end of his life was. For years I would volunteer at local animal shelters and find myself gravitating to the senior, sick or otherwise ‘difficult to adopt’ animals. In one way or another they were nearing the end of their lives, and I wanted to contribute to giving them the love, respect and gratitude they deserved. During my Healing Touch for Animals (HTA) training, I learned techniques to utilize during a euthanasia procedure. These techniques serve to bridge this lifetime to the next realm using love and compassion. I had the honor of supporting several animal clients through this process of crossing over the rainbow bridge. Around the end of my formal training I attended the American Animal Hospital Association conference and listened to a presentation by Dr. Kathleen Cooney, DVM, president of The International Association of Animal Hospice and Palliative Care (IAAHPC). This concept of animal hospice resonated with the very core of my being, and I knew I needed to pursue this area of study. As a registered nurse for over twenty-three years I’ve had much experience with hospice for humans, and always thought the philosophy should apply to our animal companions as well. I began utilizing the concepts in my private practice and saw how bonding was enhanced and spirits were lifted. In September, 2015 Daashia and I decided, rather spur of the moment, to pack up our RV and take our three dogs - Phoenix, Libby and Skylar, on a road trip to Arizona. Our schedules somehow opened up in such a way that we had more than three weeks to enjoy time with our dogs camping, hiking and exploring new places. We found something exciting in every place we stopped to enjoy as a family. Phoenix, Libby and Skylar in Sedona, Arizona. One evening a few weeks after we arrived home, near the end of October, Daashia and I noticed Phoenix was having trouble swallowing. Upon closer inspection we found a walnut-size mass on the back part of the roof of his mouth, which seemed to have come out of nowhere. When our skilled and accomplished vet, Dr. Dunn, said the mass appeared too deep for him to remove and referred us to specialists in Miami, my heart sank. I knew this wasn’t good. The next day we drove to Miami where two different specialists examined Phoenix. They both concluded that this tumor was indeed cancerous and could not be successfully removed due to its size and location. The oncologist discussed radiation to try to shrink it. The thought of putting Phoenix through that did not resonate with us at all. At that moment we decided to skip the suggested biopsy, take him home and treat him palliatively. Phoenix and Daashia paddle boarding in the Keys. Over the next two months our lives shifted rapidly as our daily routine focused on Phoenix. Collaborating with our amazing vet we put together a holistic plan of care. In addition to his already healthy lifestyle I added Raindrop Therapy (using all organic, therapeutic-grade essential oils) with massage almost daily to support his immune system. He was taking Frankincense oil internally along with a mushroom complex, CBD hemp oil and supportive herbs. I also gave Phoenix HTA treatments daily and alternated sound and vibrational therapy. Within the first couple days of this new routine Phoenix caught on quickly. He would joyfully saunter into the healing room around the same time each day to happily receive his therapy. I also prepared home cooked meals for him and pureed them for ease of swallowing. Phoenix was enjoying organic chicken, beef, eggs and freshly caught fish, along with a variety of veggies and complex starches. To say he was over the moon about all of this is quite an understatement. Our other two dogs, Libby and Skylar, truly understood and accepted what was happening. They gave Phoenix plenty of space to rest and offered a beautiful calm healing presence when I was working with him. Phoenix loved swimming at the beach, shredding coconuts and most of all riding on a paddle board with Daashia. She would take him out on calm days, and he would be willing to stay on the board for hours. Jumping off the board for a short swim then climbing back on quickly became a favorite activity. When he wasn’t resting, swimming or receiving treatments, Phoenix enjoyed frequent car rides, trips to Home Depot and pet friendly restaurants. Many friends and family were praying for him and the energy was palpable. Our entire household felt protected by a legion of angels. As the days went on, Phoenix became increasingly tired and was losing weight (despite an excellent appetite) while slowly adjusting to the rapidly growing mass in his mouth. We thanked him every day for the gift of his beautiful spirit, and he returned the sentiment through his soulful eyes filled with gratitude. Every couple weeks we checked in with Dr. Dunn who was quite impressed with Phoenix’s good spirits despite the advancement of cancer. We continued with our routine and counted each day that Phoenix chose to stay with us a blessing. On December 30 Phoenix awoke with swelling around his eye, as the tumor had grown so large and was causing pressure. When, for the first time in two months, he didn’t finish his gourmet breakfast, we knew by the look in his eyes that he was ready to leave his tired body. We made an appointment with Dr. Dunn for that afternoon with a knowing that this would be his day. Daashia and I took him to the beach for a final time and walked together along the shoreline, our hearts and steps in sync. The water was rough and he had no interest in swimming. We then gave him a good bath which not only felt good to him, but honored his desire to always be clean and handsome as ever. For the next hour we laid with him on the floor under the dining room table - one of his favorite places. We fed him his favorite snack of cheese while sharing stories of our adventures together. Our hearts were overflowing with love yet felt so heavy at the same time. When we arrived at our appointment Phoenix put his nose in the corner of the exam room avoiding looking at Dr. Dunn, as if to say, ‘let’s not discuss this, let’s just do it’. Knowing Phoenix for so long Dr. Dunn agreed that yes, he was ready. We sat on the floor with him for the procedure and cocooned him in love and light. Within seconds Phoenix passed peacefully in Daashia’s arms. Though we miss Phoenix terribly and his magnificent presence, we know his spirit remains with us. Looking back I know everything was in divine and perfect order, and we wouldn’t have changed a thing. Realizing that healing isn't always about curing, but providing a safe, soft place for our pets during the last chapter of their lives is very consoling. Seeing dying as a normal process, as animals do, is an opportunity for growth. Allowing our deserving companions to live as fully and comfortably as possible is one of the most compassionate ways we can give back to them. 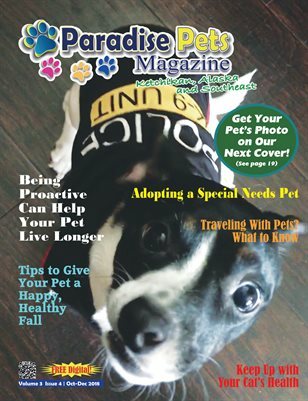 Paradise Pets Magazine, Key West, FL Jan-Mar 2016. Click to read free now! 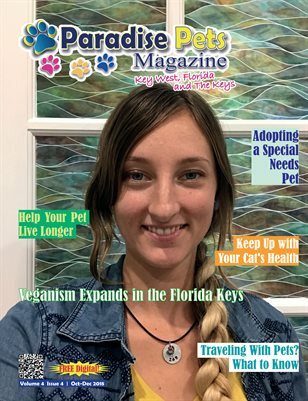 This article was originally published in Paradise Pets Magazine, Key West, FL Jan-March 2016. You can read the original article, and the entire magazine, free now by clicking the cover image to the left.